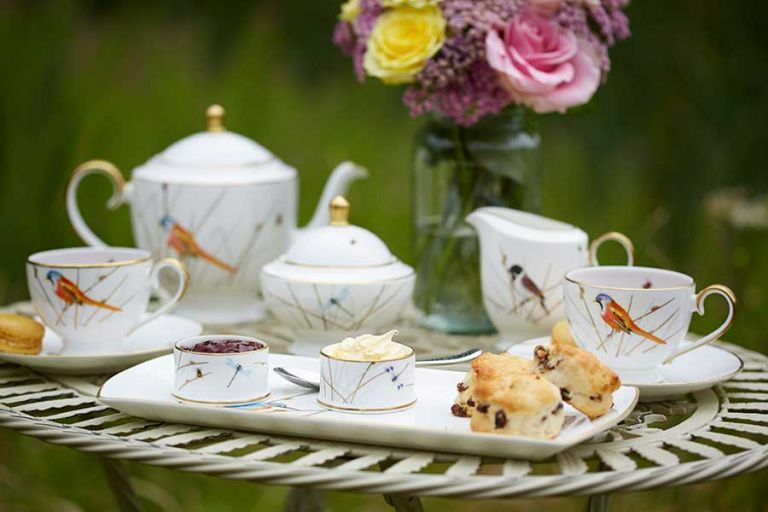 Delectable scones accompanied by lashings of jam and cream; dainty finger sandwiches displayed elegantly on a tiered cake stand; a steaming pot of tea served in the finest china... there is nothing more quintessentially British than afternoon tea. It is hard to find anyone who isn't a fan. However, disagreements run rife – from controversial modern takes on the classic afternoon tea to the order in which to work your way through the feast. So, we thought, why not present Period Living's guide to serving up a traditional afternoon tea? Count up how many of the questions below you get right and you can see how you match up to your friends, and find out who in your group puts the milk in tea first or puts their jam on before cream... Find more gorgeous things to obsess over on our design hub page. 1. You get annoyed when people call it a 's-cone'? The age-old pronunciation debate: is it 'scone' (as in 'gone') or 'scone' (as in 'cone')? In the UK the ‘gone’ scone just grabs the favourite spot, whereas the ‘stone’ scone is what sets US mouths watering. 2. You have very clear opinions when it comes to adding fruit to your scones? There's no definite correct choice – plain or sultanas – but it's a question that causes culinary contention among fans of cream tea, but we’re not fussy… both please! 3. You know the difference between afternoon tea, royal tea and high tea? Traditionally the term 'afternoon tea' refers to the ritual of taking tea with scones, cream, jam, finger sandwiches and cakes, but add a glass of Champagne and it is elevated to royal or royale tea – a popular choice on the menus of great British hotels and institutions. At Fortnum & Mason you can even have a personalised message printed onto the label of your champagne. Afternoon tea and royal tea should not be confused with high tea, which historically was the main meal in a working class household, taken with a strong brew after a hard day’s labour. 4. You know the difference between Devonshire and Cornish afternoon tea? If you prefer cream then jam, you align with the Cornish, while if you're adamant it's jam then cream, you're following Devonshire roots. Debrett’s etiquette experts favour the Cornish approach and there's definitely something aesthetically pleasing about the bright red jam on top of the cream, but this battle of the counties will run and run. 5. You have your tea with milk or with lemon? Generally speaking, black teas and robust, full-bodied blends such as English Breakfast, Assam and Ceylon are the ones usually taken with milk, although lemon is still agreeable with most black teas. However, many connoisseurs would say tea should be enjoyed unadulterated. Just make sure you never use milk and lemon at the same time, and don’t forget your lemon plate and fork! 6. You never eat your scone or cake with your fingers? You know the rules! If you’re eating ice cream, custard or something soft use a spoon; if it’s cake or pastry, you use a fork. The only acceptable finger food is the appropriately named finger sandwich, which is perfectly designed to keep your fingers clean! 7. You never stick your pinkie out when drinking your tea? 8. You prefer the traditional cucumber finger sandwiches to the more decadent smoked salmon? 9. Nothing beats crisp white table linen? Professional afternoon tea connoisseurs would favour the former, complete with a fresh pressed napkin for each setting. But we’d be quite happy with a vintage floral curtain picked up from a charity shop for a quirky rather than classy look! That said, who can resist this set up from Betty's? 10. You always put your milk in last? This is a question that has long divided tea drinkers. Historically milk was often poured first to prevent the boiling water from cracking the china in poor quality cups. However, the introduction of finer quality china meant that this was no longer necessary, so milk started being added after, a tradition that became preferred by the upper classes as it signified that they owned the highest quality tableware. Today most Brits still prefer the MIL method, possibly because it’s easier to judge the hue of your brew! How much of a cream tea expert are you? 1-3: Have you even ever had an afternoon tea? 4-6: Not bad, but maybe don't book your trip to Betty's just yet. 7-8: Perfect! Get planning your next trip now. 9-10: You're definitely a member of high-society – you've probably already got the scones warming.